Case study: Dentsu Public Relations devised a campaign that raised the profile of Japan's Kumamoto prefecture as a food-producing region. The work described here won Silver in the PR category at Spikes Asia. Consumers in Japan were not aware that Kumamoto Prefecture in Kyushu, western Japan, is one of the country’s richest agricultural regions. Most were unaware that the prefecture is a top source of tomatoes, the nation’s favorite vegetable, nor did they know about recent efforts by prefectural authorities to brand Kumamoto the "red prefecture". The campaign aimed to promote Kumamoto as a major agricultural food-producing region, especially of red-colored food such as tomatoes, and in the process encourage consumers to link the prefecture’s name with the color red. Raising the level of public awareness about Kumamoto’s prominence as a food-producing region would prompt sales of the prefecture’s produce to rise in turn, the organizers hoped. This would benefit the area financially, in particular its citizens involved in agriculture. In addition, the increased media attention on Kumamoto would lift the morale and pride of the local population, the prefecture believed. The agency devised a campaign centred on Kumamoto’s mascot ‘Kumamon’, a cute bear-like character extremely popular throughout Japan. The plan was to attract widespread media and public attention by creating an "incident". In October 2013, an announcement was made that Kumamon had "lost" his characteristic red cheeks and that a nationwide search was being launched to find them. Extensive coverage in mainstream and online media produced an enthusiastic public response, with thousands Tweeting claiming to have "found the cheeks". Over subsequent days, Kumamon appeared at public events and on TV without his cheeks, adding to the story’s momentum. Furthermore, social media sites were fully utilized, with a cheek-less Kumamon replacing the character’s usual Twitter and Facebook profiles; regular search updates, including photos, were posted. Three days into the search, Kumamon’s cheeks were declared found, and the true purpose of the episode—to promote Kumamoto as a "red" food-producing region—was revealed. 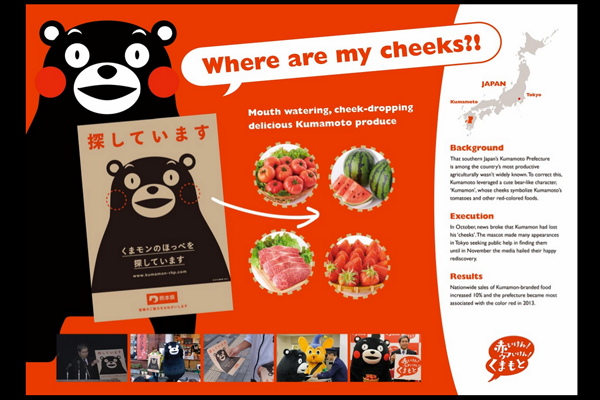 The connection was made by linking Kumamon’s lost cheeks with a well-known Japanese saying that eating something tasty makes your "cheeks fall off". Full-year sales of Kumamon-branded foods in 2013 increased 10% from 2012, even though the campaign was only launched in the year’s last quarter. The incident of Kumamon’s missing cheeks, and their subsequent discovery, earned Kumamoto wide exposure in the media as a food-producing region, with 23 TV shows, 30 newspapers articles and over 400 websites running the story. This led to a 10% year-on-year increase in Kumamon-branded food sales in 2013, even though the campaign was only executed in the year’s final quarter. The "Thank you tomato" initiative, a lottery held for 100 special boxes of Kumamoto tomatoes, also attracted widespread media and public attention, with over 10,000 applications received.